Racing Club de Strasbourg's return to Ligue 1 in 2017 awakened the team's dormant potential to draw crowds. For their first top flight season they sold over 15,000 season tickets. For 2018/19 it's expected as many as 19,000 season cards can be issued, which means the club is moving towards a sell-out crowd every game. With just over 26,000 in official capacity, they enjoyed a turnout of 24,083 in the last campaign. The demand is there and it seems now there's no turning away from the stadium debate. 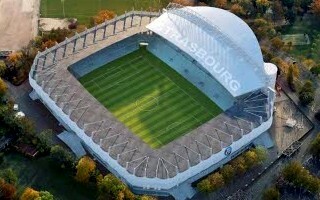 The 34-year-old Stade de La Meinau is severely outdated even with recent seat replacement and minor changes. The city has already lost out its chances to hold the 1998 World Cup and Euro 2016 due to insufficient stadium infrastructure. For the first time in many years all local authorities are on board and decided to make it happen. With public-private partnership ruled out as one more case of French stadiums moving away from PPP, the burden falls largely on authorities. The framework is already in place, with authorities pledging 60% of the €100 million budget. The Grand Est region and Strasbourg metropolitan area will provide €20 million each, while the Bas-Rhin Department and city of Strasbourg follow with €10 million each. The remaining €40 million has to be covered by Racing Strasbourg. The club, while aiming to boost annual budget from €35 to 50 million, is unable to put money on the table itself. A financial structure including bank loans and other options is being worked on right now. Most importantly, a detailed feasibility study has been created by Catevents, a Havre-based company. According to the collected data there is no point in building a new stadium from scratch, reconstruction is far more feasible, even if €100 million for a revamp does sound very steep. Aside from overall repairs and renovations, including replacement of crucial systems across the stadium, changes would include extension of the elevated promenade and covering the stadium with translucent external cladding. This would provide crucial shade in the summer and shelter from rain, snow and wind on colder days, making the concourse more welcoming, especially before the game and during half-time. Because as many as 80% of fans (roughly 20,000 per game!) arrive at the stadium from the western Avenue de Colmar, a fan zone in the west is proposed, able to accommodate 3,000-5,000 people. It would extend the matchday for many fans, encouraging earlier arrival and prolonging their stay. It's also a commercial opportunity and boost for event versatility. The most important part of the scheme is a brand new main stand in the south. It would allow the stadium to reach capacity of 32,000, maybe even 33,000 seats, while multiplying Racing's hospitality options with boxes, lounges and other facilities usable on matchday and a conference facilities on weekdays. So far we only have this preliminary concept, which is subject to change significantly, perhaps entirely. Detailed concept should follow in 2019, reconstruction is expected to begin in 2020. Final outcome? Perhaps in 2022.